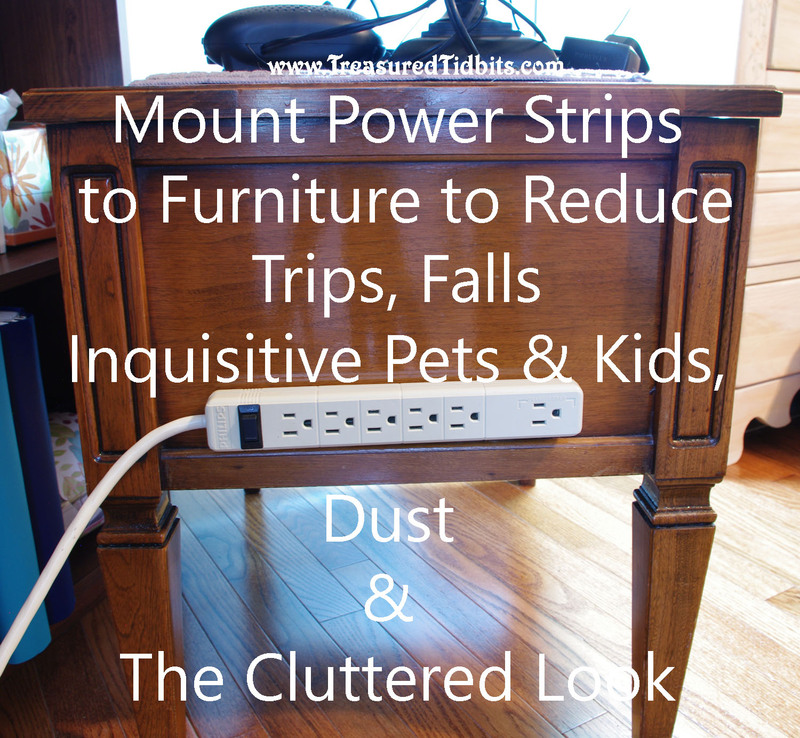 Who is tired of seeing their power cords all over the floor? 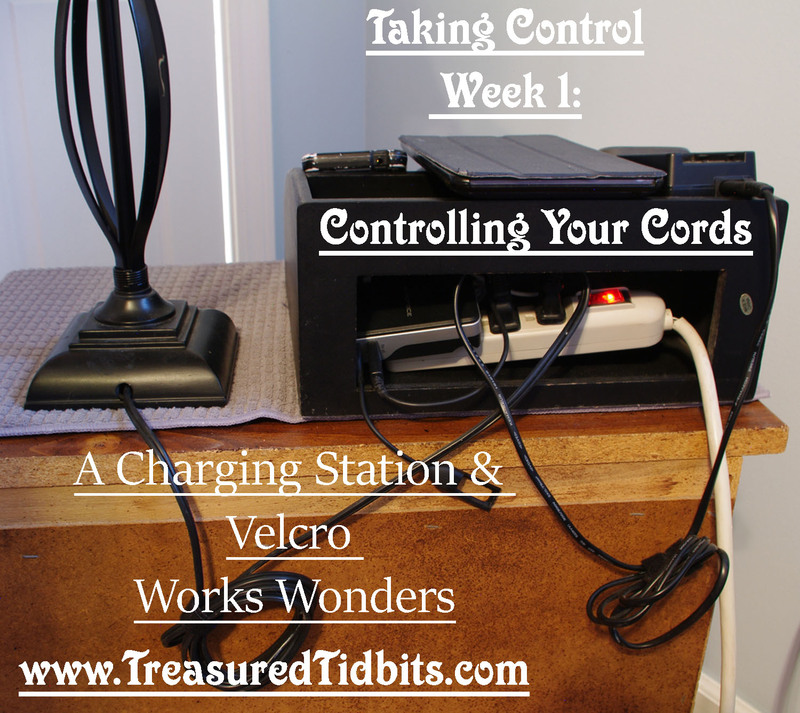 Gathering dust, growing dust bunnies and just making your space look messy? So when we remodeled our master bedroom (details to come) and I was on a mission to “declutter and simplify” our master. 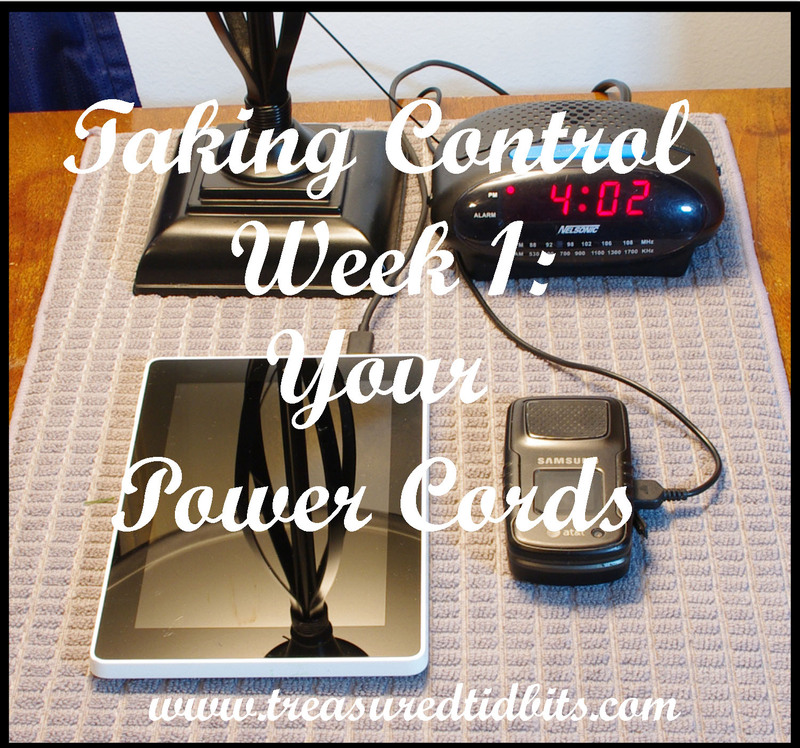 I began brainstorming how to control the mess of cords we had in four different areas of our room: my nightstand, hubby’s nightstand, my desk and the TV area. (We have a TV area because our syndrome often leaves us bed bound and I don’t want a TV in my teen’s rooms. Mean Mom, right?). 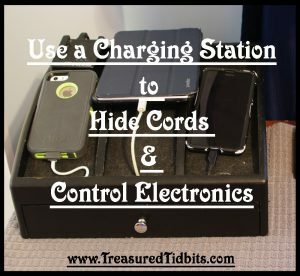 Today I want to share the solutions we found for our nightstands. My nightstand holds my tablet, cell phone, lamp, clock radio and vaporizer (not pictured because it just isn’t very pretty, it keeps my sinus migraines under control though so I use it). It very often holds my computer cord too. Before the remodel the power strip just laid on top my nightstand and was constantly being “turned off” by myself when I fell or when my five, legged fury friends stepped on it. I need to be able to unplug the chargers quickly for the days I have to run my daughter to the ER and hospital so putting it on the floor isn’t very helpful. Mount the power strip to the back of my nightstand (we discussed the underneath but my disease/syndrome would make unplugging things a challenge). Of course we still have the six cords to deal with and untangling those can be a challenge PLUS the tangled pile is UGLY! OMG! I absolutely love this stuff! Hubby has been using it for years but I just never worried about it. No MORE! My house looks so much neater with just taking 30 seconds per cord to wrap it in a little velcro. The cords are off the floor. and Best Of All They aren’t growing a family of dust bunnies (or hair bunnies in our case). What do you think? Simple, huh? 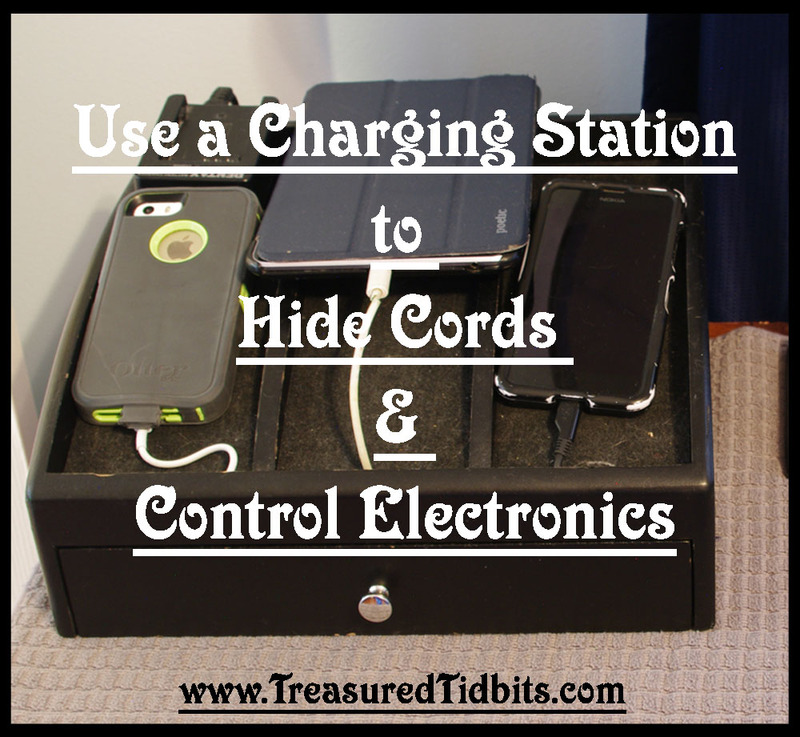 Hubby has always had a ton of electronics (for work and home) so he owns a “Charging Station”. Doesn’t that sound sophisticated? He places his electronics in each slot then feeds the cord through a hole and TADA they are all tucked neatly in the back. Isn’t that clever? 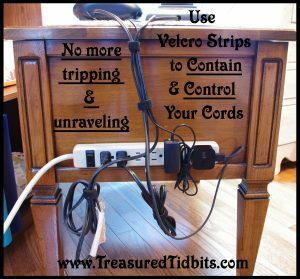 No mess, no cords, no dust and no stress. Easy, peasy, clean up is easy! I love it! Once a month I take it apart to clean any dust and dirt that has settled inside but since it is against the wall the build up isn’t too bad and at my house THAT is called a win! 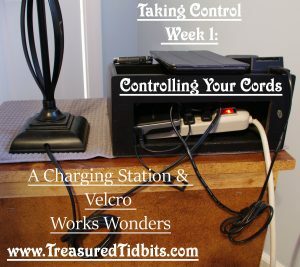 Do you have a fun or creative way to control your cords? I would love to hear how in the comments below. If you want to receive other great tips and tricks remember to follow us on Facebook, Pinterest, Twitter and Email. 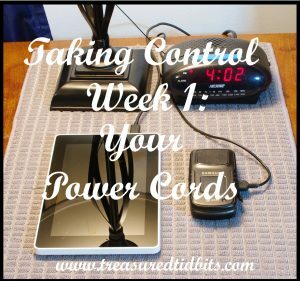 Just a heads up we will be sharing a post a week for how we are taking control of chaos in our master bedroom as well as a post a week of the changes we made to our master bedroom on a teeny, tiny budget. Click here for our disclosure policy.